Anneke Caramin: Please do dance on my grave. Have a party there. 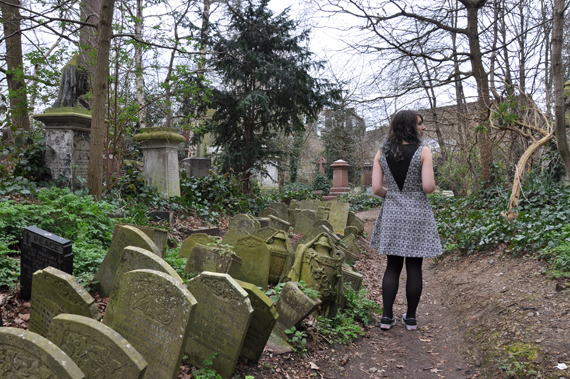 I was complaining to myself about how I didn't have anything to blog about, and then I realised we photographed a dress in London and I forgot to post it. WOOPS. 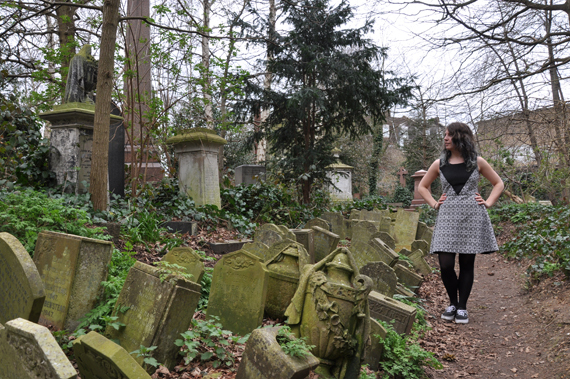 We stayed with our friends Steven and Willemien in Stoke Newington, and on our first day Steven took us to see the cemetery at Abney Park. It was really beautiful, if you're into that sort of thing! 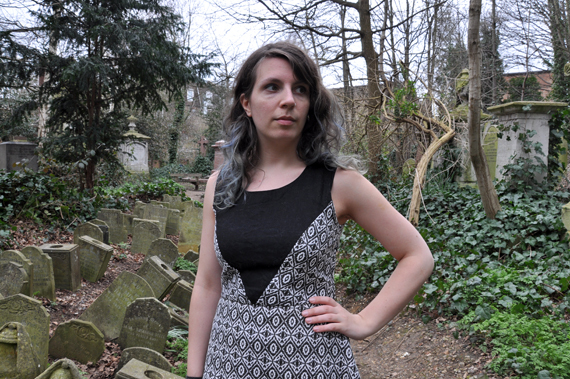 I wore a dress I'd made some time before, from a self-drafted pattern. I started with my basic bodice block and rotated the darts to the center front so they would form a V. I then just extended the dart leg closest to the center to get a princess-seamed bodice and did the exact same thing for the back! The fabric was pretty stiff and heavy, a polycotton jacquard in black and white. I drafted a sort of semi-circle skirt to go along with it. It has a lot of body, which looks pretty snazzy if I do say so myself! The black contrast panels are just plain linen from the stash. The hem is finished with a bias facing which I handstitched in place. The dress closes with a handpicked side zipper and was a surprisingly quick make, all in all! I drafted the pattern and cut the fabric one afternoon and sewed the dress in one day. I made a few alterations to my bodice block since it was getting roomy, and now it fits really nicely (as long as I stay away from that one Indian vegetarian all-you-can-eat buffet, hmm). I think this will get lots of wear. It's smart enough with decent shoes and some jewelry, but I can easily dress it down with a hoodie and sneakers. Win! Next up, if I don't crash and burn on the way there: bathing suits!